Leftover wine means risotto. I so rarely make it because (cough) I don’t like to have leftover wine, and I certainly don’t like sacrificing a hefty glass to the cooking pan. A bottle of wine isn’t a cheap thing for most of us; I hover around spending around £7 per bottle and I intend to drink my wine! But when drinking it isn’t on the cards, let’s not waste our precious my precious wine. Oh, to live in Italy or France where 4 euro wine is good! Anyway, this price point reminds us to not leave half empty glasses of wine. or be like Marina O’Loughlin and not pour hulking great glasses in the first place. If you’re tidying up after a boozy lunch or lovely party DON’T throw every half glass leftover; freeze it if you need to and know that this risotto can be filling up your bowl with all its warming and cosy goodness. 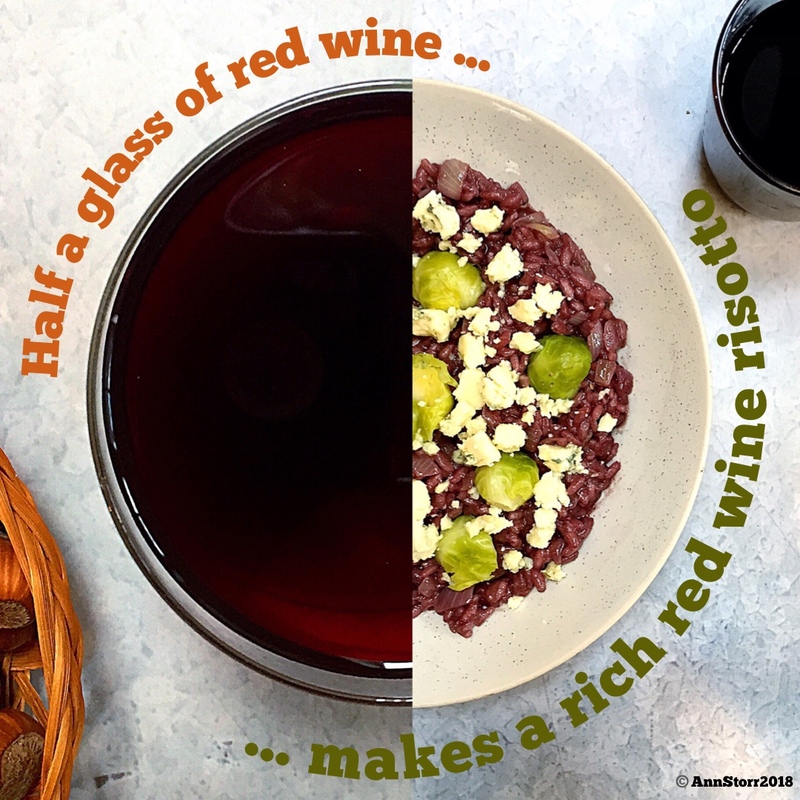 This red wine risotto can use up frozen red wine if you have some lurking. I served it to my friend Lucy with a hefty stir through of Stilton and some leftover sprouts; both optional, but if you’re feeding a lotta people on Boxing Day or after, this is a thrifty and delicious way to nail those tricky leftovers.